We first met in late 1971 at a Meet the Candidates event in the home of a friend in North Bennington. Bernie was in his first race and already aiming for the top — the US Senate. I was a local Dept. of Labor counselor and job developer for unemployed teenagers and adults. And yet, before long we were having an argument. I wanted to know more about his background and Vermont issues. He thought it was all about “the movement” and capitalism, and ended up declaring he didn’t want my vote. Explaining that I needed to know more about Liberty Union, his political party, and the candidates themselves proved useless. Sanders became increasingly frustrated with my equivocal attitude. “You have to prove you’re a basically good person if you want my vote,” I explained. Despite that inauspicious start, I have voted for Bernie Sanders more than a dozen times in the 47 years since then, in races ranging from Mayor of Burlington to Congress and US Senate. And he has certainly become more willing to talk about himself. For a while, before he became Burlington mayor, he rented an apartment across the street. Only once have I actively opposed his candidacy, although we have definitely disagreed, sometimes publicly, about priorities and tactics. In the 1970s, while I worked as a journalist, as well as for state and local government youth and anti-poverty programs, he ran for governor and US senator, supported unions and activist campaigns, and worked and struggled on as a film producer and freelance writer. We sometimes wrote for the same publications, and I once invited him to opine about mass media for a weekly newspaper I edited. In late 1980 we agreed to work together in Burlington’s upcoming elections. I was still editing the Vanguard Press, an alternative weekly, while chairing the local branch of the new Citizens Party; he was a veteran of four statewide races and had recently formed an independent coalition in Burlington. We both wanted to run for mayor, at first. But he was battle-tested and a more natural politician, while I had a job that I enjoyed and wanted to keep. In the end we met privately to talk it over. Soon afterward I withdrew from the mayor’s race, instead joining him on a coalition ticket as a City Council candidate. He won by 10 votes, with 40 percent in a four way race. I lost with 42 percent in a two-way race and returned to the editor’s desk. It was the start of multi-party politics in Vermont and led to the formation of the Vermont Progressive Party, the most successful alternative to the two majors in the country, electing local, legislative and statewide leaders — up to the level of lieutenant governor — for over 30 years. Throughout Sanders’ eight years as Burlington mayor we remained coalition allies, often working together, but also disagreeing when necessary on development and peace issues. At one point that meant he presided over my arrest (with many others) outside an armaments plant. Peace groups were protesting gatling gun production and pushing for economic conversion. He felt we were blaming the workers and should protest instead at a congressional office. After four terms as mayor, Bernie was elected to Congress in 1990, after coming close two years earlier, and didn’t lose another race until the campaign for president in 2016. (Before that announcement, he had already competed for office 20 times, most in statewide races, won 14 of them, and participated in hundreds of debates and public forums.) Meanwhile, I went on to edit other publications, defend immigrant rights in New Mexico, run a bookstore in Southern California, and manage Pacifica Radio, the progressive listener-supported network. Earlier, I mentioned the one race (so far) in which I didn’t back Bernie. In 1986 he had been mayor for five years and saw a chance to run for governor. But the Democratic incumbent was Madeleine Kunin, who had been in office less than two years and was the state’s first female chief executive. In the end, I couldn’t support Bernie that time and instead found myself role-played him in a private mock debate with Kunin. As Bernie retired from his role as mayor — to prepare for the next chapter, national office — I published a book about what had occurred and changed over the past two decades, The People’sRepublic: Vermont and the Sanders Revolution. In 1990, after defeat by Republican Peter Smith in a congressional bid, Bernie came back and won. That led to eight terms in Congress — before moving on to the Senate and, eventually, his presidential campaign. One of Bernie’s other frequent complaints is that his opponents don’t take strong and unequivocal stands, that they are basically all the same while he is different, and that the current rigged game and level of inequality are “totally outrageous” and unacceptable. He is adept at sarcasm and irony — and does have an inside voice, but his main style is proudly declarative. Bernie effectively channels and expresses what feels to millions like righteous outrage. He can be brusque, but he also comes across as fundamentally honest. Athough even his fans gently mock his hair and age, most supporters respect and trust him. For many it feels like love. It boils down to one key attribute — authenticity. In 1976, Bernie was the first “third party” candidate in Vermont to force his way into a TV debate. He was running for governor for the second time. Seated between the Democrat and Republican, State Treasurer Stella Hackel (later Director of the Mint) and millionaire businesman Richard Snelling, he effectively conveyed the idea that there was little difference between them. It didn’t win him many votes that time. But he made the point more effectively in the 1986 race against Kunin and Peter Smith. That time he got more than 15 percent, respectable for an independent. Four years later he was in Congress, after defeating Smith, the incumbent, as well as the Democrat in the race. Through all the races and years he has become adept at spinning virtually any question to repeat his carefully honed points, often without directly answering, and remains relentlessly on message. But he is ready to strike back, at the media, or even a member of the public, if he feels defensive or offended. I’ve seen him shut down a press conference when he doesn’t like the way things are going. It happened again in 2011, the last time we were in a small room together. The topic was Lockheed Martin and its relationship to Sandia Labs, which he was welcoming to Vermont. In the mid-1990s, he had led the charge against $92 billion in bonuses for Lockheed Martin executives after the corporation laid off 17,000 workers. He called that “payoffs for layoffs.” In September 1995, after his amendment to stop the bonuses passed in the US House, Lockheed launched a campaign to kill the proposal. At the end of 2010, ten days after the mini-filibuster that jump-started a “draft Bernie” for president campaign, Burlington Mayor Bob Kiss announced the results of his own Lockheed negotiations, begun at billionaire Richard Branson’s Carbon War Room. It took the form of a “letter of cooperation” to address climate change by developing local green-energy solutions. Lockheed later backed out. 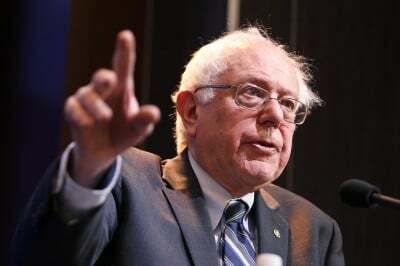 By 2011, however, Sanders was also supporting the Pentagon’s proposal to base Lockheed-built F-35 fight jets at the Burlington International Airport. If the fighter jet, widely considered a massive military boondoggle, was going to be built and deployed anyway, Sanders argued that some of the work ought to done by Vermonters, while Vermont National Guard jobs should be protected. Noise impacts and neighborhood dislocation were minimized, while criticism of corporate exploitation gave way to pork barrel politics and a justification based on protecting military jobs. When Vermont’s partnership with Sandia was officially announced on Dec. 12, 2011, Gov. Peter Shumlin didn’t merely share the credit. He joked that Bernie was “like a dog with a bone” on the issue. But the launch ended abruptly after a single question about the city’s aborted partnership with Lockheed Martin. Before a TV reporter could even complete his query Sanders interrupted and challenged it. Lockheed is not “a parent company” of Sandia, he objected. It was more like an evasion. All national labs are required to have “an oversight board provided by the private sector,” he explained. In other words, trust us to respect the appropriate boundaries, do the right thing, and follow all the rules. Moments later, Sanders announced that the press conference was over. Despite such blind spots, Bernie can be quite appealing to white working class voters, and even to some conservatives. Hillary Clinton thought she was tweaking him in 2016 on gun issues; she was really playing into his hands. Sanders is certainly pragmatic and savvy enough to realize that being a bit “moderate” on a few issues (like guns, drugs and defense) can help, in the south and in general. During the 1981 campaign — his first victory — he ran against a large property tax increase being proposed by the mayor. At the same time he insisted that “large institutions” and the wealthy should “pay their fair share.” It was a sweet spot he will attempt to find again. Running against someone like Trump, an alleged billionaire, should make it even easier for Sanders to talk about oligarchy and define the race as the climax of an historic movement. He frequently talks about “making history.” In many past mailings he has also referred to how powerful right wing forces are out to get him, something that has helped to keep his base motivated. And he has long defined his campaigns in stark but convincing terms — a choice between oligarchy or democracy. It is increasingly hard to disagree. CNN: Can Bernie Sanders Win Black Voters? CNN Video: What is Bernie Sanders’ Debate Style? Politifact: Is Bernie Sanders a Democrat? This article was originally published on the author’s blog site: Greg Guma/For Preservation & Change.